Production Workflow. Tools and Features. In a print environment, the term workflow means many things. Typically it refers to either administration or production processes, but an evolution of the technology offers an increasing convergence or integration of the two for an end-to-end solution. In part one, we discuss the evolution of production workflow to meet the demands of digital environments. Here, we continue the discussion, highlighting production workflow tools and third-party software solutions. For production purposes, workflow encompasses feature sets and tools attractive to digital print environments where the profit margin on jobs is typically lower. With the proper RIP and workflow, Piestrak believes print providers receive scalable architecture and performance enhancing features like the ability to spread jobs across multiple processors and threads and cache common elements between pages. 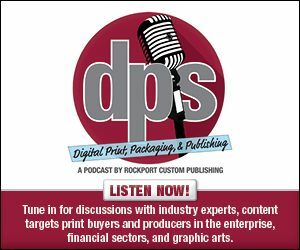 Scott Scheidenhelm, senior manager, product marketing, commercial & industrial printing business group, Ricoh USA, Inc., says automation, accuracy, and error recovery are vital for digital print providers because they often work with huge volumes of pages and data that they try to turn around at high speeds. “Variable data can connect a communicator with its audience in incredible ways. But if the customized aspects are inaccurately targeted, it can leave a customer with a negative impression,” he admits. Mark Schlimme, director of marketing, Screen Americas, agrees and says automation is key—the less touches required, the more efficient the print production and the lower the overall cost. By using workflow with automation tools, he believes print providers can produce high-quality variable data output comparable to offset printing quality. Today’s print buyers are more educated about color. According to Piestrak, many brand owners satisfied by standard colors move toward demanding, strict, objective delta E targets for brand colors. In a traditional press, he says meeting those targets is just a matter of ordering the right spot color. “Most digital presses are process color only, so that isn’t an option,” he explains. Instead, workflow is available that includes a suite of color tools to make it easy to control color whether the printer is a color management expert or not. Aside from tools targeting print output, like color management and accuracy, tools are also available for print providers seeking reports and audits of production activities. Stephanie Pieruccini, product marketing manager, Crawford Technologies, says many customers seek solutions to determine when jobs were run and who handled which component of the workflow on each job. By doing so, print providers ensure their customers’ information is secure and processed accurately with audit trail proof. In addition to monitoring for security and accuracy, print providers seek workflow tools that capture and monitor the way equipment is utilized to predict when upgrades or additional equipment is required. “Monitoring operators and utilization rates provide key information from the floor of a print production environment,” says Pieruccini. Some print providers take workflow monitoring tools to the next level and implement a dashboard solution that integrates with existing software. According to Pieruccini, a dashboard solution enables control and management of the workflow step from a single solution without having to log in and out of various tools. “Having the flexibility to incorporate all this information in one system—even if it is pulling from other systems through integration—makes it faster and more reliable to find pain points, create detailed reports, and speed up billing,” she explains. Dashboard solutions also provide flexibility to create user types that offer each production staff member the needed information to complete their job while those managing the operation can view all job components. Workflow software is available as third-party and OEM solutions. For some print providers, this presents a challenge when looking at the best tools and working with different vendors’ equipment including OEM front-end RIPs and workflow solutions. “Having a single point of entry to manage, organize, and distribute work to the appropriate output device is a major challenge,” reveals Graham Blanks, director of business operations North America, DALIM Software. For some, the difference between third-party and OEM workflow is a matter of generalization versus specialization. Michael Rottenborn, president/CEO, Hybrid Software Inc., believes digital press OEMs produce devices that appeal to the broadest possible market to amortize R&D costs across the largest number of potential customers. He offers, “this is also true to a degree for digital front ends (DFEs) provided by the OEMs—they may not provide all the functionality needed to produce a specific product as efficiently as possible,” he offers. An example of this is pre-distortion or graphic warping for shrink sleeve printing so that graphics are properly sized when sleeves are shrunk. According to Rottenborn, this may be possible with some DFEs, but it is more efficient and accurate to use specialized software. To integrate a new technology into a print shop, a thorough workflow assessment followed by a comprehensive implementation plan enables print providers to understand the workflow changes required and prepares the organization prior to installation, says Mike Zink, senior marketing specialist software partner products, Canon Solutions America. This begins with an in-depth investigation of the current workflow including data touch points, handoffs, and wait times. The desired workflow should also be taken into consideration including what it will look like, current pain points that need to be eliminated, and support programs that can help the desired workflow realized. Zink warns that new software tools may be needed for the workflow, especially when adding new application capabilities. “Ask if existing software programs can be integrated with the new solution,” he suggests. Before selecting a production workflow, print providers should consider printing equipment and business requirements. According to Dmitry Sevostyanov, CEO, Aurigma, Inc., printing equipment requirements are vital because the quality of the final products depend on them. This includes color profiles, bleeding lines, output file formats, and other unique specifications. Mark L. Myers, president, EstimatorCloud.com, a division of Estimator Corp LLC, believes moving to a cloud-based system should be a print provider’s first consideration, especially for small shops. With a cloud-based system, print providers create estimates from smartphones or tablets—enabling increased flexibility for accessing workflow from any location with internet access. According to Myers, this allows the owners to also provide instant quotes—enhancing the customer experience. “It has been shown that he who estimates first usually gets five to 15 percent more orders, also helping the printer to expand and be more profitable,” offers Myers. Another consideration for print providers is having a lower cost of ownership with a digital integration. “Digital jobs are slowed down by human interaction,” reveals Patrick Kerr, worldwide product manager, Prinergy Workflow, Kodak. Proper training allows print providers to get quality results and save money. But when training is required for a variety of different DFEs, the digital advantages decrease. To save time in training and production, Kerr advises print providers to use one overarching production workflow that controls all digital devices. Then, they can train staff to operate each device on the same platform to simplify production. With production workflow, print providers take advantage of tools for color management, automation, security, and accuracy. In the final installment of this three-part series, we provide a look at available production workflow solutions. Click here to read part three of this exclusive online series, Production Simplified.